5-18-15: 5th-grade Sagehen Outdoor Education Program kids teach 1st graders about the science they've learned. Sagehen welcomes classes, workshops, and other education use at all levels. Plan your visit. Sagehen’s own education and public service programs increase community ownership of and commitment to Sagehen, to the University of California, and to science, generally. Sagehen name recognition in the community is now widespread. 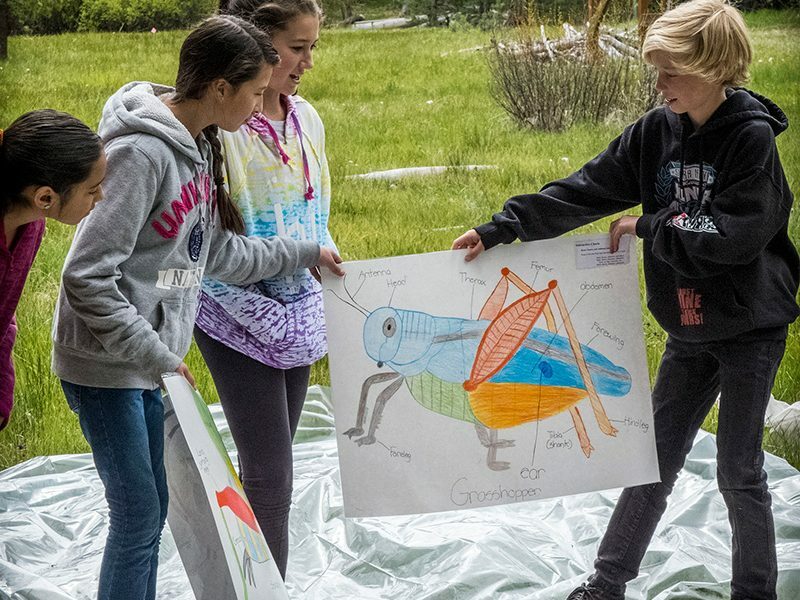 Nagging land use conflicts we used to experience in the basin completely dried up after we began offering the 5th grade Sagehen Outdoor Education Program (SOEP), which increased science scores in participating classes by 20%. Major partners in education: Berkeley RIVERLAB, Tahoe-Truckee Unified School District, Adventure-Risk-Challenge, numerous small funding donors, Sierra Watershed Education Partnerships, Tahoe Institute for Natural Science, Berkeley Natural History Museums, Highway-89 Stewardship Team, UC Davis, UCANR California Naturalist, UC Natural Reserve System. Sagehen regularly hosts university classes and graduate student workshops. UC Davis ENT 109 – “Bug Boot Camp” is Sagehen’s longest running course, occurring in alternate years since Richard Bohart first brought the class here in 1954. This is a five-week field course on the study of insects in their natural habitats; their identification and ecology. Students must collect and identify 200 Families of insects (out of only 600 in North America) within the Sagehen basin and wider surrounding region. Sagehen’s insect list comes largely from this course. More info. Sagehen was an early beta-tester, and we continue to work closely with UCANR’s California Naturalist to develop new formats for this public certification program. Several of our freshly-minted California Naturalists developed and manage a public volunteer program at Sagehen, including our annual BioBlitz events. Sagehen offers professional development courses in road ecology, geomorphology and river restoration. Adventure-Risk-Challenge (ARC), is our award-winning literacy, science and leadership program for at-risk teens (now also in Yosemite National Park). ARC completes its 15th year in 2018 and is now an independent non-profit. A.R.C. : Voices on the Rise from F. Felix on Vimeo. The Sagehen Outdoor Education Program (SOEP) was founded and organized by 3 Truckee-Tahoe Unified School District (TTUSD) teachers, the Berkeley Natural History Museums, and Sagehen Creek Field Station. The program began in 2007 and now serves approximately 350 students from five schools every year. Program operation assistance is provided by parent volunteers. The students attend either a 2-day or 3-day overnight program at the field station in the Fall. In the Spring, all 5th graders attend a 1-day program. The students of Truckee Elementary participate in a second 1-day program when they mentor 1st graders, and become their teachers for a day at Sagehen. The SOEP program provides local students access to a learning environment that is literally in their backyard. Students learn a variety of skills and gain knowledge about many different topics. Lessons include team-building, local ecosystems, flora and fauna of the Sierra Nevada, macro-invertebrates, water quality, plant and animal identification. Classes are taught by outdoor educators, and educators from two local non-profits: Sierra Watershed Education Partnerships (SWEP) and Tahoe Institute for Natural Science (TINS). The students also learn to live and work together as a group. These 5th graders leave Sagehen with a greater appreciation of nature, science, their local environment, and each other. Launched in 2011, UC Davis’ Bio Boot Camps are field-based camps of up to 8 days at Sagehen and other UC field stations for junior-high and high-school aged students who are interested in the natural sciences. Read more about the student’s research projects at Sagehen. Programs with UNR scientist Lee Dyer, and the South Yuba River Citizen’s League’s (SYRCL) Rachel Hutchinson allow kids to participate in real scientific research at Sagehen.